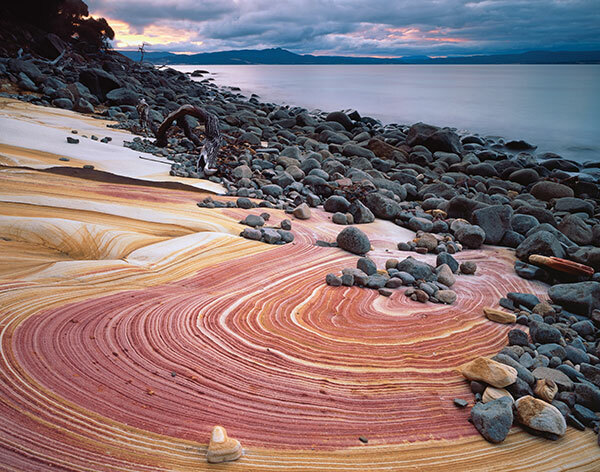 Along the East Coast of Tasmania lies a perfect destination for a road trip, a boat tour or a camping trip. 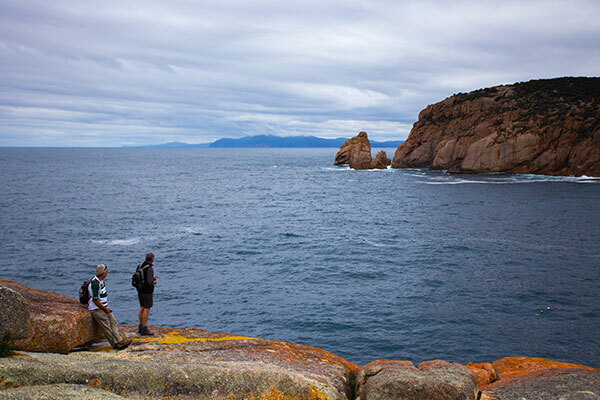 When staying in Hobart a day trip up the East Coast to Triabunna or tranquil Orford then across to Maria island is well worth it. Rugged cliffs, sweeping bays, historic ruins and remarkable wildlife, Maria will work her spell on you. A National Park, Maria Island is only accessible via boat or small plane and while there is a regular ferry service, the only way to get around once on the island is by foot or bicycle (which you can hire). You can stay on the island but accommodation is limited, there’s camping if you plan to spend the night. The buildings and ruins around Darlington comprise two distinct convict periods and two distinct industrial periods, each of which left it’s mark. The historical aspect of the island is a big draw for some visitors, from the ancient fossils and the legacy of the sea to the history of it’s human occupation. 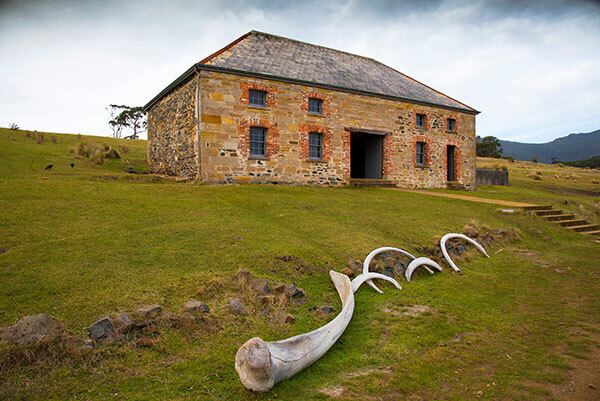 One of the most iconic buildings, the stone Commissariat Store, just 150 m from the jetty, is the island’s oldest building. 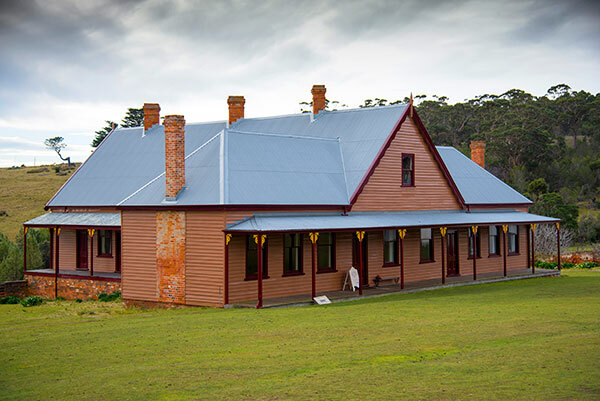 The building also serves as visitor reception, historical displays and island information. Park entry fees and Penitentiary and camping fees can be paid here. 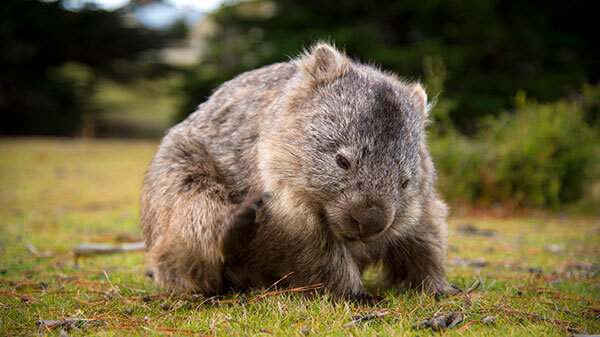 The island is host to a range of great walking tracks and you always have the chance to spot the iconic native wildlife such as the adorable and iconic wombats. The Painted Cliffs and the Fossil Cliffs are two popular walking destinations for day visitors, both on the island’s coastline and both taking around 1.5 – 2 hours return. 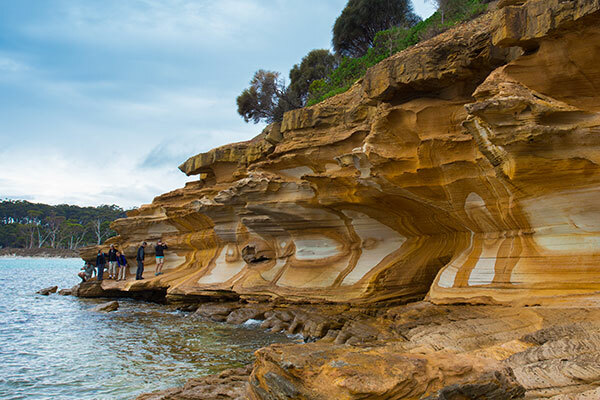 Beautiful sandstone and limestone cliffs prolific with ancient fossils. Definitely think about conducting the guided tour run by Great Walks of Australia. 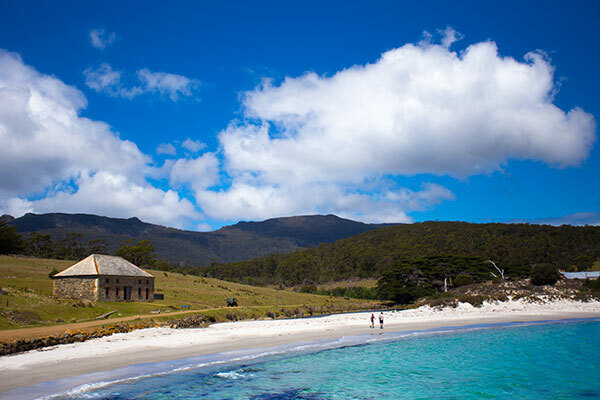 On the Maria Island Walk, you’ll explore a heritage listed convict settlement, walk empty white-sand beaches, view rare wildlife, and enjoy gourmet food, all in the confines of this incredible national park. 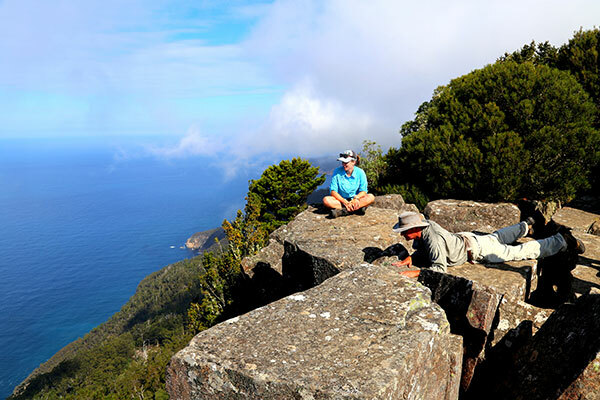 Those staying longer may wish to tackle the longer hikes up to the top of the Island’s two mountains, Bishop and Clerk and Mount Maria. These hikes take roughly 5-7 hours return. 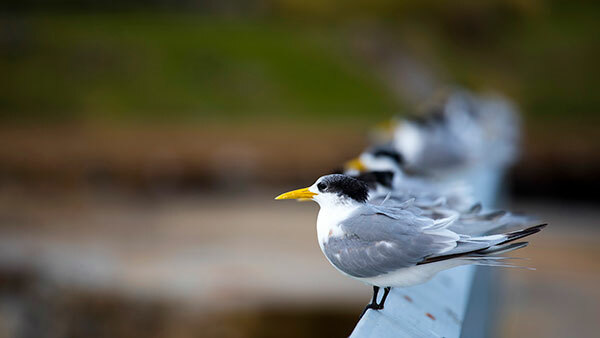 When exploring, you may start to notice the special nature of the wildlife on Maria island. Since the late 1960s Maria has become somewhat of a Noah’s Ark, with a number of threatened species having been introduced in a bid to protect them. Ironic that what made the island so perfect as a convict settlement also made it an ideal refuge for endangered plant and animal species. 15 captive Tasmanian Devils call the island home. A vehicle track perfect for riding extends from Darlington south to Haunted Bay, named so because of the evening calls of the Fairy Penguins which live there. Apart from Darlington, the major campsites are at Frenchs Farm, 11km from Darlington and Encampment Cove, a further 2km away. Further down lies the ruins of Maria Island’s second probation-era convict station at Point Lesueur on the west coast. Beaches and coves are tucked away and well worth the effort of reaching them. Soldiers Beach and Bloodstone Beach on the western side are particularly exclusive. Orforda is a mini destination in and of itself. Golfers will delight in the well regarded 9 hole golf course, the coastal walk along the clifftops and pristine beaches of Raspsins, Millingons, Spring and Rheban are tranquil places of unique beauty. You can also head to Thumbs lookout in the nearby Wielangta Forest which offers a spectacular view of the region. Fishing is abundant and you can angle for flathead, trevally, trumpeter, abalone and southern rock lobster, fishing is NOT permitted around Maria island so keen anglers will want to put a trip to Prosser Bay near Orford.